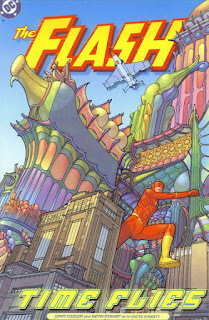 Time Flies is an OGN (original graphic novel) starring Wally West as The Flash. It is not part of the general continuity of The Flash v2. I actually had the pleasure of reading this comic at the Paseo Verde Public Library (in the Green Valley area). It was a decent read. 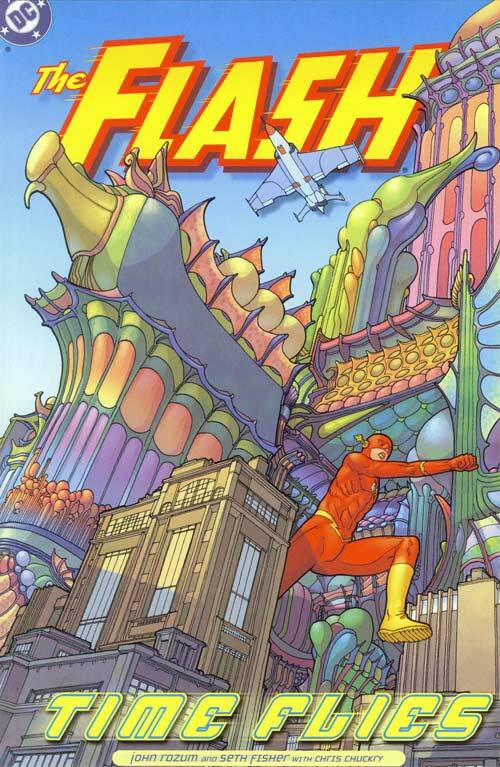 The main story involves Wally West using his cosmic treadmill to travel into the future to track a pilot. The jet pilot somehow 'broke' the speed force at some point in the past (I think it was the 1940s) and is travelling through time. He meets a man in this new future who doesn't have a body. Well, he does have a body, but it looks like a giant insect body with his defrosted head in place. Anyway, it is imperative that Flash meet this time travelling pilot –– who is nicknamed 'Blur' –– because breaking the speed force has affected Wally West's present time by speeding things up. The most interesting concept (to me) within this comic was the idea that –– if the speed force is altered –– it can affect how long time seems. In other words, you know how people say 'time is flying' in reference to the concept that things move much faster as you get older? Well, I've been dealing with that thought myself now that I am 34 years old. It sure does feel like time is moving faster and this book touches on that. Also, the phrase "time flies when you're having fun" comes to mind. Another interesting thing this book brought to my attention is –– I wonder how many other people in these comics are faster than The Flash? –– Because Blur was faster than The Flash.